Choose your perfect shade match for the ultimate photo filt’r in foundation form. Choose your exact skin tone match to conceal blemishes. For under-eye darkness and hyper-pigmentation, go for 1-2 shades lighter than your skin tone. A FentyBeauty.com exclusive: Customize your own complexion set with all the full-sized essentials you need for the ultimate gentlemen’s Fenty Face: Pro Filt’r Soft Matte Longwear Foundation and Match Stix Matte Skinstick in the shades of your choice, Invisimatte Blotting Paper, Invisimatte Blotting Powder & Portable Touch Up Brush 130. 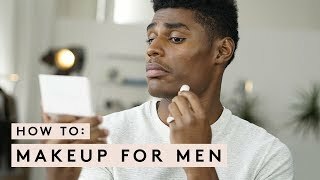 Alright fellas, your Fenty Face essentials have arrived—because men deserve to have perfect skin too. Whether you’re hitting the red carpet or just need a quick fix, we’ve got everything you need right here. 1. PRO FILT’R SOFT MATTE LONGWEAR FOUNDATION: Choose your perfect match from 40 boundary-breaking shades. Pro Filt’r gives skin an instantly smooth, pore-diffused, shine-free finish that easily builds to medium to full coverage. The oil-free formula is made with climate-adaptive technology that’s resistant to sweat and humidity, and won’t clog pores so that wherever you are, it’s going to work on your skin. Best of all, this light-as-air longwear foundation is undetectable on skin so you always look like you. 2. MATCH STIX MATTE SKINSTICK: Conceal & correct in 20 shades obsessively fine-tuned and tested to look good on the full spectrum of skin tones. Made to layer, the buildable cream-to-powder formula is weightless and super easy to blend, but also stays put. No creasing and caking when you apply it—so even the delicate undereye area is fair game. 3. INVISIMATTE BLOTTING PAPER: Super compact, portable, and straight-up chic, these oil blotting sheets are beauty’s ultimate underdog with a serious makeover. Because—take it from Rihanna—blotting is key to keeping your makeup looking just-applied. 4. INVISIMATTE BLOTTING POWDER: The translucent powder contains an exclusive pore-diffusing complex that absorbs shine and gives you a natural matte refresh for an instantly filtered look—so you’re always ready for a shine-free snap. The universal formula is completely traceless against all skin tones and won’t cake, clog pores, creep into fine lines, or disturb makeup. And get this: It extends the wear of your foundation, too. 5. PORTABLE TOUCH UP BRUSH 130: Custom-made to pair with Invisimatte Blotting Powder, the brush has a retractable design and magnetic panel, so it snaps right in to the bottom of the powder compact, always there when you need it. Slanted, soft synthetic bristles provide extra surface area for applying Invisimatte—perfect for quick fixes and a mattifying, instant-filter effect. 1. Sheer out one pump of Pro Filt’r Soft Matte Longwear Foundation on hand before applying to cover minor imperfections. For areas with razor bumps, take one pump of foundation directly on damp Precision Makeup Sponge 100 (not included) and blend into skin. 2. Use fingers to apply Match Stix Matte Skinstick under eyes and areas that need more coverage. 3. Using Portable Touch Up Brush 130, dust Invisimatte Blotting Powder all over the T-zone and other shine prone areas. 4. Blot on the fly throughout the day with Invisimatte Blotting Paper.